I met Raja Kumari at a Para Legal Volunteer (PLV) Reorientation Camp at Vellore. She excitedly told me that she has been a PLV for the past two months and has conducted eight micro camps in Thiruvallur Taluk and helped eight transgender persons obtain pattas for land after petitioning District Legal Service Authority (DLSA). The role of PLVs is essential in identifying the problems at the grassroots level and bringing it to the notice of the DLSA. PLVs are the first point of contact for inmates in need of legal aid or advice. They make all efforts to identify inmates in need of legal aid, visit police stations on a regular basis to ensure no person remains unrepresented and maintain records. They also are available at all times to render basic legal counseling and advice to inmates. They provide information on all such cases to the community PLVs on their visit. The PLVs, trained in counseling, are deployed to ensure that citizens from mostly weaker sections of society are assisted legally at police stations whether one is a complainant or victim or an accused. The aim, enshrined in the Legal Services Authorities Act, 1987, is to offer legal aid free of cost at police stations in cases where one may not be able to access a private advocate or financially hire one’s service. The scheme is implemented specifically to ensure women, children, marginalized or backward sections of society get free legal aid at police stations. DLSA has provided such facilities at the courts as well. By providing justice services, community-based PLVs offer a solution. They are less expensive and more accessible than lawyers. They can often resolve justice problems faster than the formal legal system. At the same time, these PLVs are backed by lawyers who can engage in litigation when necessary. Community-based PLVs have a deep knowledge of the people they serve and can provide solutions not just to individuals, but to whole groups. Perhaps, most importantly, PLVs are able to empower their clients, helping them to become aware of their rights and act to advance their interests. PLVs have basic knowledge of the law, the legal system and its procedures, and basic legal skills. PLVs are a member of the community or part of an organization that works in the community and have basic knowledge of the ways community members access justice services including through traditional or informal justice mechanisms. More often, PLVs communicate ideas and information to community members using interactive teaching methods. Increasingly, PLVs have working relationships with local authorities and service delivery agencies and use their community organizing skills to empower communities to address systematic problems on their own in the future. PLVs offer unique skills and professional characteristics that enhance efforts to improve justice for the poor. Similar to the gap that rural public health workers fill in relation to doctors, PLVs provide a dynamic, cost-effective, community-oriented alternative to lawyers. PLVs do not replace lawyers but by working in conjunction with them can enhance the use of the law and the applicability of legal and policy solutions to individual and community problems. PLVs bring together skill sets belonging to diverse professions, such as social workers, mediators, educators, traditional community leaders, interpreters, administrators, and lawyers, with the added value applying these skills according to the specific needs of the situation and the community. PLVs facilitate informal and early resolution of problems that make it unnecessary to go to court. This diversion saves time and expense for all parties. The preventive approach taken by PLVs through community education and advocacy not only prevents existing problems from getting worse but also helps to forestall new problems as they emerge. The National Legal Services Authority (NALSA) and the State Legal Services Authorities (SLSA) have, since inception in 1987, framed numerous schemes for effective legal aid delivery to various sections of the community under the Legal Services Authority Act, 1987. Further, villagers in India will soon able to connect directly with city lawyers and receive free legal advice via video conferencing as part of a government initiative aimed at improving access to justice for the country’s poorest and most marginalised. Villagers will access the service through newly established “Common Service Centres” (CSCs) -single-window centers providing online services to the public in rural areas where there is little or poor internet connectivity. Through the “Tele-Law” portal, people will be able to access lawyers, selected by the government in their state capitals – and seek advice on anything from land disputes to domestic violence cases via video conference. Village women will also be trained up as paralegal volunteers and will act as the ﬁrst point of contact for rural citizens, explaining the advice given by lawyers and assisting if further action is required. 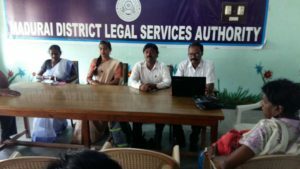 Swasti Health Catalyst has found that there is a paucity of PLVs and Legal Aid Clinics (LACs) working with vulnerable groups. From data collected during Avahan III, Swasti gathered that only 5.36% cases were reported to PLVs. The number of cases referred to Legal Aid Clinics was 0.52%. Out of the 890 people enlisted as PLVs, 583 have been trained. There has been an increase in incidence rate by 14% and the reporting rate has been reduced by 12.65%. The numbers could look more encouraging once more PLVs receive their training. PLVs form the bridge between community members and the world at large and training and reorientation of PLVs working in the remotest of villages is the only way to make access to justice a reality.